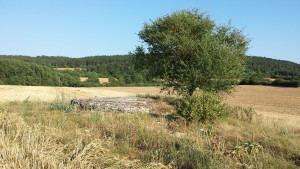 Nestled beneath a solitary tree in a hayfield on the outskirts of Pommard, this dolmen bears witness to an ancient past. Dolmens, ancient stone megaliths, are thought to mark ancient burial sites throughout Europe, and Burgundy is no exception. This 5,000 year old site and others like it provide evidence of a rich prehistory dating to Paleolithic times. In a more recent past, the tribal society of the Gauls dominated the landscape from the 6th to the 1st century BC. Numerous archeological sites and museums such as Bibracte bear witness to this complex civilization. Thanks to Julius Caesar’s prolific writing, we know well the history from 59-51 BC, when Roman armies marched north building encampments and roads as they conquered the Gaulish tribes. The final battle that led to the spread of Roman civilization throughout much of what is now France occurred at Alesia. Today, on the actual battlefield site, a modern and interactive museum recounts the details of the end of Rome’s successful campaign. Over the next 350 years, Rome established the city of Augustundum, now Autun, as the capital of northeast Gaul. A modern map of the region will show that in the north, all roads did, indeed, lead to Autun. The fall of Roman rule transpired during the late 4th and early 5th centuries as Barbarians from the East began to move in and take control from the Roman government. One particularly advanced group from Burgundia, on the Baltic coast, arrived on the Saone plain. These people persisted long enough that the modern name of the region, Burgundy, or Bourgogne, in French, derives from their homeland. Over many centuries the Burgundians would rise in power and influence. Their ruling dukes would come to the height of their prestige in the 14th and 15th centuries under the house of Valois, many of whose chateaux and tombs are prominent attractions today. From the death of Duke Charles the Bold in 1477 until the French Revolution, the region was gradually annexed and consolidated under French rule. Of course the other powerful influence in the region has been Christianity. Embedded since Roman times, the church played a major role in the development of Burgundy. Cluny, a town in the south of Burgundy, rivaled Rome as the center of the church for many years. The religious order based there, the Cistercians, were instrumental in the development of wine-growing in the region. The Revolution ushered in the modern age by democratizing the region, and re-distributing much of the wealth and power into the hands of the people. Business, trade, and creativity flourished. Being at a crossroads in Europe necessarily engaged the region heavily in the two world wars, and those histories remain very much present in the consciousness of today’s citizens. Because modern roads and railways did not reach the region until the 1970’s, many of the old ways remain. Old world customs and sensibilities are very much intact and open to discovery. Having been inscribed as a UNESCO World Heritage Site in July, 2015, Burgundy is certain to maintain its charm. A re you drawn to a particular facet of this rich history? Talk with us about your interests, and Your Key to Burgundy can help you to gain an insider’s understanding through our local knowledge and contacts.